Yam farmers in Trelawny, north-west Jamaica are increasing yields and saving money by using treated bamboo poles as yam sticks. 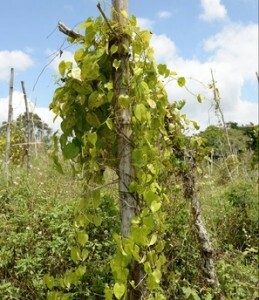 The bamboo yam sticks used in Trewlawny have a number of additional side struts that promote extra lateral growth and assist in anchoring the vines as they climb. The farmers save money in two ways: less bamboo yam sticks are needed with the side struts in place, and the treated bamboo lasts longer. The use of treated bamboo for yam sticks has the potentially far-reaching consequences of reducing deforestation, and thereby enhancing groundwater conservation. 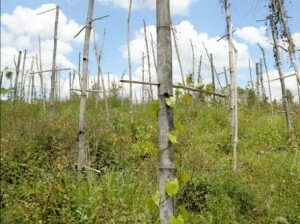 In recent years, cutting down young forest trees for yam sticks has produced record rates of deforestation in Jamaica. This practice is unsustainable. The young forest trees only last for about two years or less as yam sticks, but take at least five years to regrow. Comments on the article from readers indicate that for yam farmers in St Catherine, in the south-west of Jamaica, the use of bamboo is nothing new and they don’t bother with the ‘treatment’. Rather they, “cut the bamboo [on a] ‘dark night’ when the moon shines the least,” to achieve a similar insect-repelling outcome. 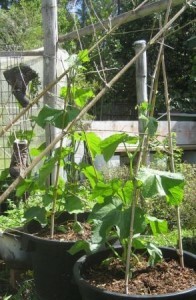 I use bamboo in the vegetable garden. With a ready supply of bamboo on hand, I don’t treat the bamboo for the garden. It lasts for a few seasons and I cut some more. In summer, a frame for a shade cloth canopy is created by hammering star pickets into the earth and ramming large diameter bamboo culms over the star pickets. In the winter, our main vegetable growing season here in the tropics, bamboo is mainly used to support cucumbers and encourage pumpkin vines to grow in the desired direction. The top end of the smaller bamboos, branches intact, are also useful to stop birds stealing seedlings. 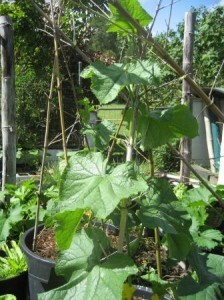 Are there any creative uses for bamboo in the vege garden you’d like to share? This entry was posted in All, Bamboo around the world, Bamboo in the garden, Food, Home and Health and tagged bamboo, deforestation, harvesting bamboo, Jamaica, vegetable garden, yam sticks on 22/05/2014 by Deb.